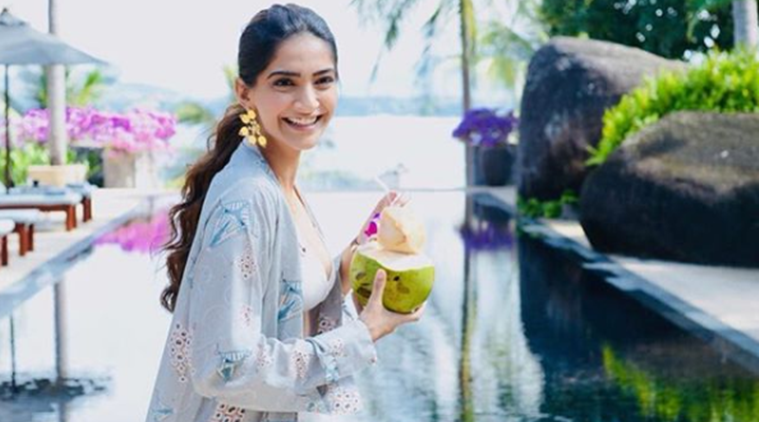 Sonam Kapoor vacations in Phuket in this chic outfit and we think the subtle colours are a perfect pick for the holiday season. What happens when brilliance meets beauty? Well, the result is an explosive combination! In case you are confused, we are talking about sisters Sonam Kapoor and Rhea Kapoor who are out with their latest drop for their fashion brand, ‘Rheson’. The ‘Neerja’ actress chose to turn model for the brand’s new Shibori collection, and looking at the pictures will make you want to pack your bags and go for a vacation. With Rhea Kapoor at the helm of designing, the collection captures the mood of vacation. ”Welcome break from the hustle-bustle of the city”,the actress wrote while sharing pictures on Instagram. In white matching separates, Kapoor nailed the chic and laid-back look to the T, looking picture perfect as she holidayed in style. We like the pale blue shrug she layered her bikini and pants with. With interesting embroidery details, we think the shrug would be ideal to snuggle into after a relaxing swim. See pics. The subtle colours and soothing strokes do make the outfit look very elegant and the fact that the 32-year-old paired it with statement earrings in gold, upped the ante of the look. In mussed hair, minimal make-up and sipping coconut water, she looked like a breath of fresh air. The easy-breezy slides rounded out her holiday look. What do you think about the actor’s style this time? Let us know in the comments below.